The storied history of the Heineken Cup rivalry between Munster and Castres will write its fifteenth chapter when the two old foes clash again at Thomond Park on Sunday. No other clubs have met as often in the tournament, which in itself brings about plenty of potential pitfalls for both teams. Castres' middling Top 14 campaign thus far means that they are likely to send a strong team to Limerick with one eye on advancing to the knockout stages, but head coach Christophe Urios will be mindful of a couple of important facts. The French outfit have never won on Irish soil, while the last time they arrived in Limerick (back in January), Munster racked up a 45-point victory, which was their biggest winning margin against Top 14 opposition. Difficult Having won the league last season, one would assume that Castres will put a greater focus on Europe this year, and while they will be a different proposition at home next weekend, it is difficult to see them troubling Munster too much at Thomond Park. For Peter O'Mahony, however, it is the draw in Castres last season that sticks out, rather than the thumping win in Limerick. "We drew with them in the first game last year, I remember it was a hot day and people gave us a bit of stick and wrote them off; obviously they went on to be Top 14 champions," O'Mahony recalls. "We knew the day afterwards there were opportunities for them and for us, but we were happy to come out of there with a draw. "Even the game in Thomond Park in round six it was hugely close up to a certain point. It was 6-all and then (Keith) Earlsy scored and it just gave us a little breathing space." A shock defeat at home to Agen last weekend will have Castres gunning for revenge as they look to build on their impressive win over Exeter Chiefs last time out in Europe. That victory has breathed life back into their challenge and Munster are mindful of that. "It's incredibly physical," O'Mahony maintains. "They lost at the weekend and we know how passionate they are of their home records, and we know they'll be hurting this week to come and put a performance in, and to make that right. So we're expecting a massive challenge. "Their lineout has been very, very effective, particularly their lineout contesting. They have some very good jumpers. Their pack is always what sets the tone for them. "That's probably why we've a bit of a relationship with them. We're quite similar that way. "They've had some ups and downs, but we know that particularly in Europe, it brings a different side out in a team, and we're expecting nothing less from Castres. "They've a massive kicking game. They try and put huge pressure on and force penalties, and their line-out maul is hugely effective. "So the discipline battle is going to be hugely important this weekend, and the less access we can give them with regard to penalties the better, because they're very clinical when it comes to 15/20 yards out. "First and second in the group at the moment, you'll know after these two weeks where the whole thing stands really. Your European season depends on this Saturday really for us, because we're first up at home." Munster will be boosted by the remainder of their Irish continent returning to the fold for this weekend. With the returning internationals, who are full of confidence following an outstanding November Series, adding an extra edge to training, coupled with the returns of Conor Murray and Chris Farrell, Munster feel as if they are in a good place. 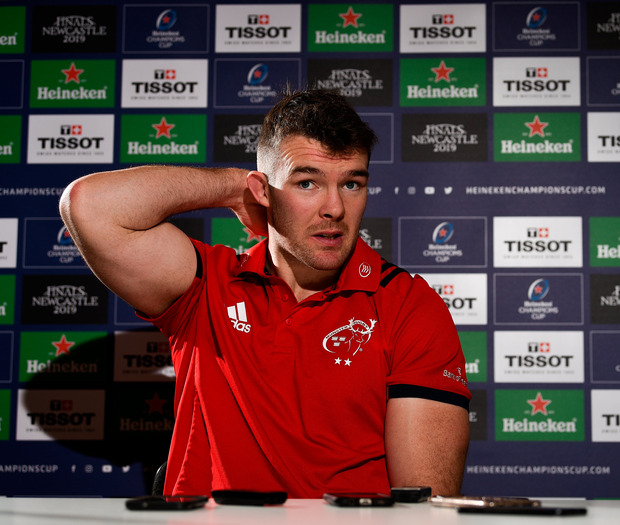 Having enjoyed an outstanding summer tour, O'Mahony has maintained that form throughout the start the season and arguably hit new heights last month. Better With a place in the knockout stages very much within Munster's heights, the 29-year-old believes that he can still get better. "I think my pre-season has stood to me," the skipper adds. "The amount of rugby I have played has stood to me now. It takes a while to get back into getting match-fit and I'm feeling good now. "Looking back on the last four or five games I've played, there's a huge amount of improvement and movement in that direction for me as well. "It's a good place to be, but we've another massive test this week and after that you're just judged on that one. So, it's about me getting myself right now this week for a massive challenge."